One of the most common questions we receive is why a shopper of bronze art should be wary of Asian (Thailand, China, Philippines, Indonesia) imported bronze sculpture. The answer comes down to three things: the metal, the art, and the artist. One of the most important reasons to shy away from Asian bronze sculptures is the quality of the bronze metal itself. 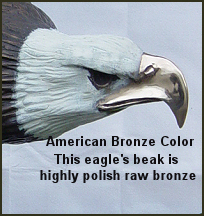 In the United States we have a minimum standard for bronze of at least 90% copper. There are even name-brand bronze metals such as Everdur used for very high-end sculpture that is 98% copper. 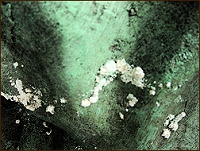 We have tested the metal used for Asian bronze sculpture and it came it at 55% copper. The uninformed might say, "so what." 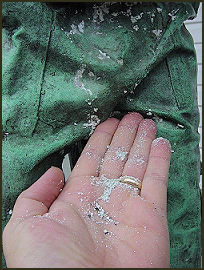 So let's explore why this semi-precious metal is so important to bronze sculpture. First and foremost, it is the copper content in bronze that gives it its resistance to corrosion. This is extremely important especially if the sculpture will be displayed outdoors or in a humid environment. We contemplated carrying imported sculptures at one point and have seen first hand what happens to them over time. The metal develops this white flaky corrosive material on the surface that resembles the corrosion on an old car battery. I have also seen rust spots develop which is an indication of iron compounds in the metal. This is not good and a sign that the sculptures may eventually break down. The copper content in bronze is also what allows bronze to develop a patina or color. In its raw state, bronze is gold in color (see picture below). Imported bronze is actually silver in color. When the sculpture is cast and assembled, the artist colorizes the bronze by reheating it and applying chemicals that react with the copper in the bronze and literally changes the surface color of the bronze. Different chemicals result in different colors. The most common patina is achieved with liver of sulfur that results in a brown patina. Click here for more information on the patina process and your choices of colors. On quality sculptures, the patination process is done by hand by skilled artist that have a lot of experience with patina chemicals and how to achieve the best effect. However, on many Asian bronzes they cut corners on this process by reheating the bronze sculpture and dipping it into the patina solution. This results in a uniform, lifeless coloration. Because Asian imported bronze is so low in copper content it does not accept a patina the same. Instead of a rich dark color you will often get a light faded color. As a result, many of the Asian foundries apply chemical dyes to the surface of the bronze to give it the desired color. That is not a permanent patina and will fade and come off over time leaving the original faded color. Sometimes Asian bronze sculptures are coated with a clear coat lacquer to preserve the finish. However, any lacquer, regardless of the quality, will eventually begin to crack and peal. Once this happens you will be faced with a very difficult decision to live with it or make the investment in removing the old lacquer and applying new. 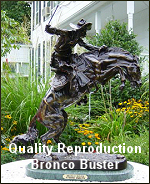 A quality bronze sculpture should not need a lacquer finish. Finally, one should avoid Asian imported bronze because of the art itself. 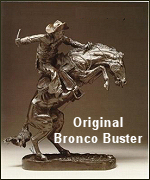 I have seen reproductions of Frederic Remington's work that barely even resemble the original sculptures. I speculate that is because the reproductions are made from photographs rather than having the original sculpture to work from. Also, to be completive on price they often take shortcuts in the details. Click on the pictures to the right to see the difference for yourself. Many Asian foundries employ their own in-house artists to create new sculpture. These people are paid slave wages with little or no concern for workplace safety. I have seen pictures from the foundries with people with bare feet and no protective clothing. This is an industrial environment with extremely heavy machinery and molten bronze metal in use. This would be unimaginable in the United States. Moreover they are not allowed to sign their work or take credit for their creations. That's why they arrive in this country with no name at all or a fictitious Americanized name like Jim Davidson. A significant problem with imported sculpture is that there have been many instances where Asian artists have copied the work of living artists (usually American artists) that is still protected by copyright. This can cause a significant legal problems for the buyer. 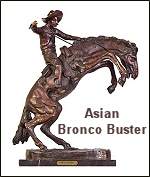 Because of all these reasons we do not carry Asian imported bronze sculptures at our gallery. However, we can certainly get them and our pricing is always reasonable. Moreover, we won't let you make a mistake and buy a really bad piece. Just recently I had a guy want me to get him a statue he saw on another web site and I told him I wouldn't do it. I knew the Thailand Foundry and I knew the artwork and both were just terrible quality. So what is a bronze shopper to do? Well, you need to consider the design you want and your budget. Then, if you cannot find a sculpture made from American bronze that fits your situation you might want to consider an Asian import. There are many dealers selling Asian imports all over the Internet. They don't tell you they are imported from Asia and some even claim they are American even when they're not. I don't think some dealers even know themselves where their statues come from or how they are made. Some claim they don't know where they're from just to cover up the fact that they are imported. My advice would be to give us a call and let us take a look at it. If it's a good product we'll tell you and if not we'll tell you that too. It will certainly save you a lot of headaches later and we might be able to save you some money in the process as well.